Sometimes I think it would be fabulous to go to your own little secret spot in your home. Secret passages are a little creepy and a little fun all at the same time. My friend Whitney and I used to "search" for secret passages in our home even though our parents told us they were certain there were none. We thought surely they were wrong. Then it was about discovering something secret and the thrill of the search in our imaginations. Now it would just be nice to disappear at times, unplug from the world and just go sit in a little nook, cozy and warm with a nice blanket, cup of tea and a good book. While exploring Pinterest, I have come across so many great examples of adult home hideaways, some completely hidden, some simply tucked away. I'm convinced I need one in my home one day. I might even carve out a nook in my apartment somewhere! 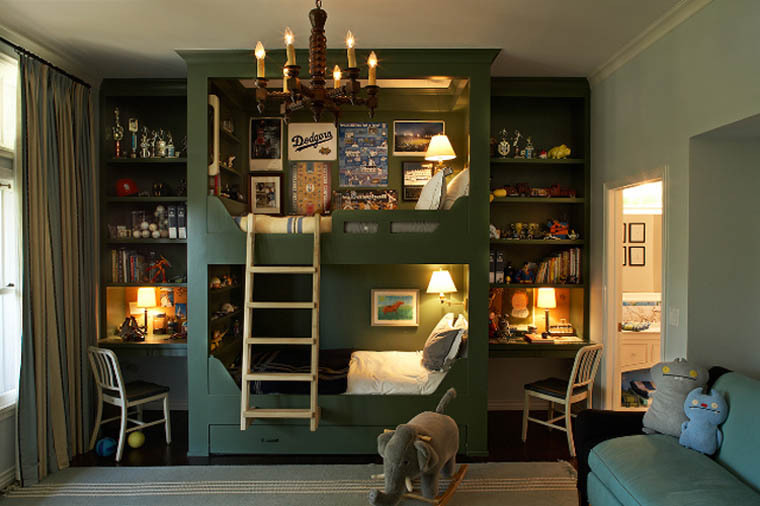 Great modern way to make bunks cozier. So lovely for spring and summer with a glass of lemonade. How mysterious and well organized. Now THIS is a secret passage, especially with those stairs. If I ever had extra closet space, this is what would happen. I love the window in this space so it's not so closed off to the world.